wow love it!! i entered all the giveaways i could find for this book and still didn't win a copy. really hoping that i'll get lucky this time! My favorite new book is Scrap Republic. Need to enter your giveaway for that! Love your new book, thanks for the chance to win! My favourite book at the moment is Quilting from little things by Sarah Fielke. i'm really looking forward to the new modern minimal book from alissa haight carlton. Scrap Republic is my current covet... *sigh* So many books and quilts to make! So little time! I think I would have to say Scrap Republic, but I would be very happy with this one too!! Scrap Republic looks like a great one....and this one as well! Tho I have been able to flip through the Scrap Republic at a local quilt shop. I have not seen this one, tho. The cover is just eye candy! I am anxiously awaiting the arrival of Block Party at my door. I am hoping it will give me more confidence in improvisational piecing. that book looks delicious & inspiring!!! GAH! THIS one is one of my favorites! I also would still love to get my hands on Elizabeth Hartman's book (I know, I'm a little behind the times...) and I am totally intrigued by Modern Mix. Deploy that Fabric looks good, but I really love a good ROY G BIV color scheme so Scrap Republic comes close. Fresh Fabric Treats isn't in my library either so that would be a welcome addition! I already bought Deploy that Fabric! It is awesome and can't wait to break out my Dad's old uniforms. There Are so many I can't pick just one! I have never owned a quilting book before! Let's hope this week holds some promise to solve that issue. i don't have/own any quilting books yet. but i hope to win this one. thanks. Ooo - this book has been on my wish list for a while now... I'm also wanting to get my hands on Deploy That Fabric! Thanks for the chance! I have to agree with a lot of others, Scrap Republic looks yummy. I'm looking forward to the MBS book. My current favorite book is scrap basket suprize. It shows you how to use your scraps cut into 2.5" strips to make a varity of quilts. This book work well with jelly rolls too. There have been a few floating around on blogs lately that look good, specifically Scrap Republic and Modern Mix. I don't buy a lot of quilt books (mostly because my bookshelf is already full of them) but those two are possibilities for the Christmas list this year. I just bought "A Field Guide to Fabric Design" at PIQF (the big quilt festival in the SF Bay Area). I've always wanted to know how to design fabric - it seems like magic! I haven't yet had a chance to thumb through it but this week it's my reward after several errands and chores! I am still anxious to get my hands on Block Party... it's on my Xmas wish list so hopefully my husband will pick up a copy for me! Modern Mix looks great, but I would LOVE to win this one too! I won a copy of Quilt Retro and am very excited to see it. Deploy that Fabric is one that I'm really itching to get my fingers on and start putting sticky notes on all the pages of stuff that I want to make (yeah, I'll have all the pages marked in no time). But Fresh Fabric Treats looks like a must-have addition to my quilting library too! So many books, so little time. I will have to live to be 125 to make all the quilts on my bucket list. There are so many coming out in the next six months that I am looking forward to that I have a list going. I'd love to add this one to my library. They all provide inspiration in one form or another. Thanks for sharing. I think I'm looking forward to Deploy that Fabric the most. I think. I don't know, I'm looking forward to SO many books it's hard to say! Thanks for the giveaways! Scrap republic is my fav! Scrap Republic looks like a winner. It would be quite awesome to win this autographed beauty, though! Scrap Republic is one that catches my eye. Thanks for running all of these giveaways! I really want to get Block party but have to hold off as I know my guy has it ALREADY for me for Christmas (Scary organised man that he is!) My personal buy when it's in the UK will be Scrap Republic, if I don't win a copy! My sewing room needs me to buy that book so I can get to my sewing machine through all the piles of scraps :) Fresh Fabric Treats is in my Amazon wish list too though (I read almost as much as I sew) so fingers crossed for winning as I think 2 sewing books maybe too much for my man to cope with at Christmas! I'm looking forward to Scrap republic (of course!) and the new Best of Quilting Arts - due out in December I think! I've been ogling Modern Mix by Jessica Levitt since it did its blog tour. 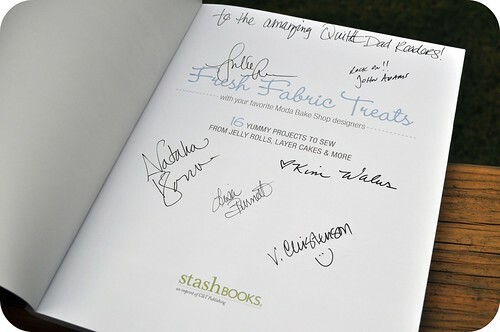 I love moda bakeshop and a book signed by all those fabulous people would be amazing. I can't wait for Gretchen Hirsch's retro sewing book! I can't wait for Lisa Lam's next book about bags. She has fantastic patterns and so many tips and tricks in her first book (The Bag Making Bible) that I'm really curious about how she's going to top this. It was on my birthday list and I still have one present coming to my: my best friend's been in hospital and said that afterwards she'd get THAT book for me. With a son who just joined the Army, I think I'm most looking forward to getting a copy of Deploy that Fabric! Actually, this is this book I would like. I am a beginning quilter just finishing up a very colorful quilt for my granddaughter who will be 7, a couple of mug rugs (love them!) and a batik for me- although the finishing scares me! I love the Moda Bake Shop fabric. I'd love to try this. I am impatiently waiting on the release of Spotlight on Neutrals by Pat Wys. Rumor (her blog) says she is in possession of the book. I'm wanting my copy! I love the look of "Simply Creative Quilts" by Maya Chaimovich, but I also need to get her last book. This book looks so great! I would love to have a closer look! I just love Deploy that Fabric! I'm looking forward to getting a copy of "Sewing for Boys" by Karen LePage. I've dropped enough hints, I should get at least one copy for my birthday!!! I have yet to get any of the recently published books and first on my list has been this one. Thank you for the opportunity! I am eager to see Modern Mix of the ones floating around currently. I don't go to book stores or quilt stores much so have not had a chance to browse any recently. I have shelves full of quiting books. Thx for your generosity here. I'd really like a copy of Modern Mix! Thanks for this extra special giveaway! I think the one I really want to get my hands on is Modern Mix. I love the idea of this one!! Thanks for sharing. Modern Mix has me intrigued at the moment. I love quilt books so there's always a few I want to get my hands on. Right now, I'm really enjoying Growing Up Sew Liberated. Not a quilting book, but there are some really great projects for kids within. What fun books! What inspiration! Thank you for having such great resources! Will have to put them on my wish list! I do not have big stash, I am a new quilter, but i LOVE great books with wonderful ideas!! Thank you for the opportunity! I think Jessica Levitt's Modern Mix tops my list. And I'm looking forward to YOURS! My absolutly favorite quilt book is Camille Roskelley's 'Simplify', I love every project in it. And on my list is definitly Carrie Nelson's 'Another bite of Schnibbles'. Thnaks for the chance to win. Has to be Scrap Republic. I love colorful quilts, and I have so many scraps to use up! Thanks! Hard question, want all 3 books, that is the best answer I can give. Thanks for a chance to win this nicely signed book. This book could be my new favorite! Kaffe Fassett's Quilts of Sweden is what I am pouring over right now. I love star quilts and am drooling over the one on the cover. I can't wait for Vanessa Christensen's book to be available for purchase! I dont have any books, so this one would be a treat. Thanks for the giveaway. I'm really looking forward to the Colette Patterns book. Quilts are my first love, but it would be cool to sew myself the odd item of clothing. This and the sewing A-Z book are top of my list :) Did you hear that Santa? Oh how I'd love this book! Thanks for the chance. I'm looking forward to Quilt Retro (and so many others). The Modern Mix seems to be my favorite new book. But I would like to win a copy of the moda bake shop book. I knew there was a reason I haven't bought this book yet! I'm looking forward to Jacquie Gering's book coming out in May, Quilting Modern. i am looking forward to Emily Ciers new book, i love Quilt remix. Scrap Republic! I am trying to teach myself all about color and I love her scrappy style. I have been studying your blog carefully -- thanks very much for the tip about mixing charm packs and your stash! I am in the midst of trying this as a color exercise; I am going to make some mug rugs as ChristmAs gifts. I am trying to get through a piecing book, I forget the name off the top of my head, Freshly Pieced or something? It's really cleared up some of my bad habits and mistaken notions. I'm anxiously awaiting Sunday Morning Quilts by Amanda Jean Nyberg and Cheryl Arkinson (Crazy Mom Quilts and Naptime Quilter). Amanda told us about it on her blog, coming out in the spring. This sounds like a commercial, but the Crazy Mom blog has helped me out so many times I'm thrilled to buy a copy. I really want this book! Modern Mix is on my list of books to get as well as Fresh Quilting. That books looks awesome! Thanks for the giveaway. I have already pre-ordered my Fat Quarterly book through Amazon - I can't wait until May! Look at you, having everyone sign it! So much fun! It looks like a really terrific book. I'm also excited about Scrap Republic, and I can't wait for Fat Quarterly's Shape Workshop! Is it weird that I print out each issue when they come out, and I keep them all in a big binder together? I really want Scrap Republic (I save scraps religiously), and also Sewing for Boys. Yum! Thanks for the chance. I've fondled Modern Mix at my LQS and have been leaving hints for the Birthday fairies. I actually am really excited for Scrap Republic. I can't wait to get my hands on a copy of that! Thanks for having all of these giveaways! I'm looking forward to Scrap Republic (the blog tours really work! ), the new Schnibbles book by Carrie Nelson and also one that I can't remember the exact name, but has projects from bloggers who do swaps. Yikes, I'll have to look that one up again. Thanks! I am not familiar with too many upcoming quilt books. This one has been on my list since the Blog hop. Anything that uses pre-cuts is nice to have. A Field Guide to Fabric Design has to be up there on my list. But MODERN MIX is at the very top. I have to have this book, it's modern designs and color mixing are really calling to me. I'm really looking forward to Modern Blocks... I've had it in my wishlist forever, and when I checked on it today, I found out that it's finally available! Yippee! This book looks fabulous! I love moda precuts! I am hoping to add the new Fabric-by-fabric One-yard Wonders to my collection at some point! I am really excited about Fresh Fabric Treats. I have many Moda jelly rolls and layer cakes in my stash. I love finding quilts meant to be made with them. I have this book on Christmas wish list....but if I win that will leave space for another fave: Practical Guide to Patchwork! I would LOVE to win this book. What a great giveaway! I also like Patchwork-Play Quilts: Make the Most of Scraps, Spare Parts, and Leftovers (That Patchwork Place). Oh to pick just one favorite new book. That is difficult since so many have come out recently or are about to come out. There are so many that look amazing. I'd really love to get a copy of Practical Guide to Patchwork as well as the Sewing for Boys. Thanks for another chance to win a great book. I'm looking forward to Modern Mix - if I don't win it, I'll have to buy it! I'm also looking forward to Sunday Morning Quilts! Love Modern Mix and this book would be special with all the signatures - thanks for your generosity! I don't have any quilting books and this book looks like it would be awesome, so does scrap republic! Thanks for the giveaway! I'm looking forward to Urban Country Quilts. I like the new Modern Mix. Looks like it has great stuff. My favorite so far has been simplify by camille roskelly. There are lots of others I would like to read, but haven't had the copies in my hands. My most recent acquisition is "Drawn to Stitch" by Gwen Hedley. Whoa, this book is total eye candy to me. If I had to pick a book that is very recent, it would be, "A Field Guide to Fabric Design" by Kim Kight. C&T Publishing has some really great titles coming out. I find them all interesting!! My current favorite book is Livin Large. Thanks for the chance to win. I'm looking forward to Carol Doak's new book. I'm in love with paper piecing, so I can't wait to see what she comes up with next. I put Quilt Retro on my Amazon wish list this week - it looks amazing!! Looking forward to another bit of schnibbles. You would think working at a bookstore I'd be set. yet here I am in the full throes of book lust! Thanks for the opportunity to win a copy! Would love to win the book. We never get to see these downunder. I am ready to learn to add that next dimension to my quilting. I've had this book on my wish list for a while. I would love to win a copy. :) I would also love to have a copy of Scrap Republic. scrap republic is probably the one that is tempting me the most :) Sure would love to sink my needle into the Moda book, though! It looks like Fresh Fabric Treats is my fav book right now! Thank you for the opportunity to win it! Ooh...there are so many to choose from! I'm saving my pennies for "Quilting Modern"...and I just saw posted on FB Alissa Haight-Carlton's new book "Modern Minimal". Inspiration abounds! Scrap Republic is the book I currently crave! I really must use up what fabric I have in the current financial climate. And if oil and gas prices continue rising in the UK we will need all the quilts I can make to stay warm. I am looking forward to this book being released down here. We often miss out on books, or they are outrageously expensive. Still working on a queen size from Quilts Made Modern. I love Moda, my first two 'real'quilts were in Moda, and I love the feel of them. Guys who quilt! 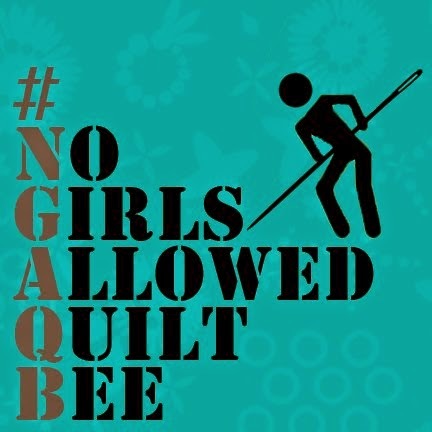 We need some in our Melbourne Modern Quilt Guild. I think Modern Mix looks really good. I just recently started doing modern pieces, so it has the most interest to me right now. I'd love to have a copy of Jelly Roll Quilt Magic, by Kimberly Einmo. The book you are giving away looks awesome as well! 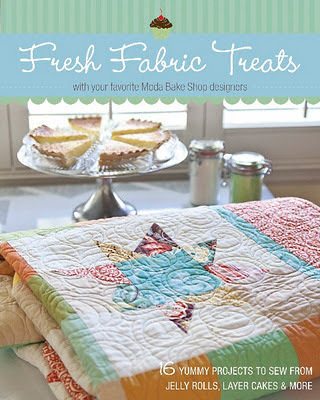 I like the Fresh Fabric Treats...love Moda Bake Shop....or the Modern Mix. Thanks for the giveaway and love your blog!! Scrap Republic!!! Would love the Bake Shop book. scrap republic would be awesome,plus I need a few more hours in my day so I can SEW MORE! Modern Mix is my favorite. Just the kind of quilter I am. So, I just finished my very first quilt two weeks ago. I used Boo Davis's book, Dare to Be Square, and I just liked the cover...don't judge a book by it's cover my foot! It helped for sure, but I could use some more ideas. Thanks! Another vote for Scrap Republic here, and this book of course! The book from Sarah Fielke :Quilting from little things! I am hoping for Scrap Republic because I need a way to use up some of my scraps! It's such a great book! Crossing my fingers I get the winnings! I would have to say that I am anxiously awaiting Scrap Republic and any books by Gwen Marston-her newest one is called...? I forget! Thanks for the giveaway! Ooooh! Hope I'm not too late, I'd love to win a copy of the book. I have just got The Farmers Wife Sampler Quilt book & have a sneaky feeling I'll be joining all the other Farmers Wives in the quilt along very soon. Wow, I just stumbled on your blog. Beautiful stuff! I would love to have the opportunity to win this book. I don't know if this counts as "new" but I am waiting for Block Party to arrive! I also am super excited for Scrap Republic! Thanks for the chance! I would really love to get my hands on one of the new Moda books. Fresh fabric treats? I would love a copy of this book, thankyou for the chance! I would love a copy of the book "Modern Mix". The quilts you highlighted are gorgeous! This looks lie a great book but really, I LOVE all quilting books! Thanks for the opportunity. Love the look of the Modern Mix....my fingers are crossed! I am looking forward to getting my 99 Modern Quilt Blocks book in the mail hopefully by the end of this week! I've had my eye on this one as well. I have this book on my wish list. Would love to win it. only one book that we are looking forward to?!?! tough choice - but I think it is Patty Young's book as I have known patty since way back when in our ebay days and have been her cheerleader ever since! I would really love Carrie Nelson's new Schnibbles book. I love making smaller projects, but her new book is taking the small Schnibbles to new heights :-) Thanks! Scrap Republic would be my choice right now. I love all the colors in those quilts. I am excited about the new Schnibbles book coming out and also hoping to get a copy of the BHG Sew Scrappy Volume 2. I am new to your blog, but so happy to have found it. Thanks! However, if I won this book, the screaming in my head would finally stop!! ;^) And it sure looks like a winner to me...complete with AUTOGRAPHS! WooHoo! I would love to win, it looks like great inspiration! Wow-can't believe you are giving this away! Just got- 3 times the charm! 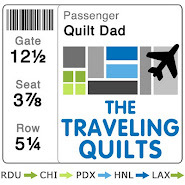 I loved the post about the quilt for you cousin who is again battling cancer. Wouldn't you love to see her face when she opens the package? It is gorgeous. Modern Mix is currently the book I am looking forward to viewing. Not normally my "style" but I am really drawn to the photos I have seen. Congratulations on your first featured project in the book! I am most excited about is Sarah Fielke's Quilting from Little Things. I like Another Bite of Schnibbles. I have an earlier book and have enjoyed it so much! Oh gosh. Modern Mix and Scrap Republic are both on my wish list. And now I read that Alissa Haight Carlton (sp?) has a new book coming out, too. So my list is growing, as is my anticipation. I think the modern Mix book looks very interesting. It would give me a much needed boost to try out more solds. I have a huge list of books I need. This could easily be added to that list. Make Your Bed by Leslee Evans is currently at the top of the list. She has some beautiful bed runners...next year's Christmas gifts for my most of my family. One lucky couple gets a whole quilt. ooh this is fab! I would really like to get Modern Mix!! 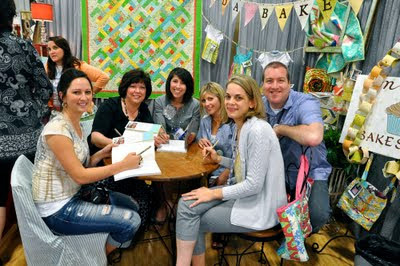 The very first blog I ever read was Amanda Jean's over at Crazy Mom Quilts. I'm really looking forward to her new book, Sunday Morning Quilts. Even the cover looked cozy! I'm a newbie, so they're ALL new quilting books for me : ) I'm just buying them all!!! I am really looking forward to seeing the "pretty in patchwork doll quilts" book out soon. Oh, goodie, another chance to win this book!! it's been on my wishlist for some time now. I'm most looking forward to Modern Mix!